Jordin Sparks is the self-titled debut studio album by American pop and R&B singer Jordin Sparks. It was released on November 20, 2007 in the United States and November 27, 2007 in Canada and Christian music stores. In United States it debuted at number ten on the Billboard 200 with sales of 119,000 copies in the first week. It has produced four top twenty singles, with "Tattoo" reaching number 8 eight on the US Billboard Hot 100, and "No Air" reaching number three. The album has sold over 3 million copies worldwide, her best-selling album by far. Sparks supported the album with the As I Am Tour and Jesse & Jordin LIVE Tour. The album was certified Platinum for sales in excess of 1,000,000 by the RIAA in the US on December 12, 2008. Sparks won the sixth season of American Idol. On August 17, 2007, it was announced Sparks had signed to 19 Recordings/Jive Records/Zomba Label Group, becoming the first Idol to join the label group, the second being David Archuleta the following year. All past Idol winners and runners-up are or were signed with the RCA Label Group’s J (Fantasia, Ruben Studdard), Arista (Justin Guarini, Taylor Hicks, Blake Lewis) or RCA (Kelly Clarkson, Bo Bice, Clay Aiken, Katharine McPhee, Chris Daughtry, Diana DeGarmo and idol successor David Cook) labels, with the exception of Carrie Underwood signed to Arista Nashville. Sparks has stated that she recorded some songs for the album but the bulk of the recording was done in Los Angeles after the tour was over. She said the album would be "Top 40, radio-friendly, uplifting stuff" hopefully mixing "the pop rock sound of inaugural Idol Kelly Clarkson with the R&B edge of Beyoncé". Jordin confirmed on her MySpace that the official track listing as well as the release would carry bonus tracks at Wal-Mart, Sony, and the iTunes Store. An exclusive video of the photoshoot for Jordin Sparks was posted on Sparks' YouTube channel in October, where snippets of "Permanent Monday", "Overcome" and "One Step at a Time" could be heard. There are two available covers of the album, one for the US and Canada, and one for the UK and Australia, although the US and Canada cover was available in the UK and Australia (in stores and on iTunes) until "No Air" came out in those countries, in which the new cover was released. The song "Permanent Monday" was featured in the Salt Lake City audition episode on the 8th season of American Idol. The song "Young and In Love" & "This Is My Now" were featured in spirit episodes of MTV's The Hills. The first single released was "Tattoo", which was released to U.S. radio on August 27, 2007. The song became the album's first top ten hit, peaking at number eight on the Billboard Hot 100. The second single released was "No Air", a duet with Chris Brown, which reached number three on the Billboard Hot 100. On February 28, 2008 Billboard stated that "No Air" was the top digital sales gainer after selling 73,000 downloads. Both "Tattoo" and "No Air" have been certified platinum by the RIAA. "No Air" has also reached number one in both the Australian and New Zealand singles charts. "No Air" was the number one song of 2008 in New Zealand. The album's third single, "One Step at a Time" was released on June 10, 2008 and peaked at seventeen on the Hot 100 giving Sparks her fourth consecutive Top 20 single. She is the only American Idol contestant to have all of their first four singles become Top 20 hits. "This Is My Now" was released after the victory of Sparks on American Idol. The song reached the Top 20 on the Billboard Hot 100, but never received official release as an album single. The album entered the Billboard 200 at number ten, and has since sold over one million copies. It was released in the UK on April 14, 2008 but did not enter the UK album charts until July 2008, where it peaked at number 17. The album was certified Platinum in the U.S. on December 12, 2008. Critical response to the album has been generally favorable. Billboard stated Jordin brought "a first effort that's all over the map—and works" while sounding "like exactly what she should be singing at this age and juncture in her career." Entertainment Weekly gave the album a B+ saying her debut "is as much effervescent fun as any post-Idol bow" and added "Idol has crowned winners with even bigger voices, but it hasn't given us one who's any easier on the ears." ↑ Parker, Lyndsey (2010-11-24). "Does Winning 'American Idol' Even Matter Anymore?". Music.yahoo.com. Retrieved 2012-05-20. 1 2 3 4 "Recording Industry Association of America". RIAA. Retrieved 2012-02-26. ↑ "Archuleta signed with Jive". Jive. ↑ Graff, Gary (August 13, 2007). "Season Six Idol Stars Prepping Debut Albums". Daily News. Retrieved 2007-09-20. ↑ Graff, Gary (July 2, 2007). "Idol Sparks Juggling Touring, Recording". Daily News. Retrieved 2007-09-20. ↑ "Jordin Sparks signs with Jive Records group - Access Hollywood - MSNBC.com". MSNBC. 2007-08-17. Retrieved 2012-05-20. ↑ "Release Date". Fmqb.com. Retrieved 2012-05-20. ↑ "Flo Rida Starts Tenth Week Atop Hot 100". Billboard.com. Retrieved 2012-05-20. ↑ Thomas, Stephen (2007-11-20). "Allmusic review". Allmusic.com. Retrieved 2012-05-20. ↑ Billboard review Archived November 18, 2007, at the Wayback Machine. ↑ Rodman, Sarah (2007-11-20). "The Boston Globe review". Boston.com. Retrieved 2012-05-20. ↑ "Entertainment Weekly review". Ew.com. 2007-11-16. Retrieved 2012-05-20. ↑ "Jesus Freak Hideout review". Jesusfreakhideout.com. 2007-11-20. Retrieved 2012-05-20. ↑ "The New York Times review". Nytimes.com. 2007-11-26. Retrieved 2012-05-20. ↑ "Rolling Stone review". Rollingstone.com. Archived from the original on December 7, 2008. Retrieved 2012-05-20. ↑ "Slant Magazine review". Slantmagazine.com. Retrieved 2012-05-20. ↑ USA Today review Archived October 4, 2008, at the Wayback Machine. ↑ Vibe review. Books.google.com. Retrieved 2012-05-20. ↑ O'Donnell, Kevin (2007-11-20). "The Washington Post review". Washingtonpost.com. Retrieved 2012-05-20. ↑ "Idol Chatter: American Idol News, Rumors, & Information". USA Today. May 7, 2010. Retrieved May 7, 2010. ↑ Jordin Sparks (2007): Reviews. Metacritic. Retrieved on 2010-04-18. ↑ Jordin Sparks Archived November 18, 2007, at the Wayback Machine. ↑ "Music Review: Jordin Sparks, by Jordin Sparks". Entertainment Weekly. 2007-11-16. ↑ Australian ARIA Top 50 Singles Chart. Australian Recording Industry Association. Retrieved on June 8, 2008. ↑ "The Official New Zealand Music Chart". Rianz.org.nz. Retrieved 2012-02-26. ↑ "Official Singles Chart 2008" (PDF). Retrieved 2012-05-20. ↑ "Jordin Sparks - Jordin Sparks - Music Charts". Acharts.us. Retrieved 2012-05-20. ↑ "Idol Chatter 5-12-2010". Content.usatoday.com. 2010-05-13. Retrieved 2012-05-20. ↑ "Jordin Sparks (Album) by Jordin Sparks". iTunes Store. Apple. Retrieved 2012-05-02. 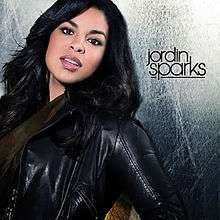 ↑ "Jordin Sparks - Jordin Sparks - cd di Jordin Sparks - - disco di Jordin Sparks - IBS". Ibs.it. 2012-02-06. Retrieved 2012-02-26.